Remember these cookies? 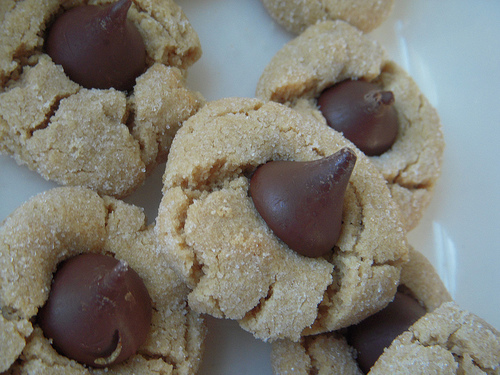 I had them when I was a kid: peanut butter cookies with a Hershey's kiss. They were a treat, and the more chocolate to peanut butter cookie the better... and they were BEST just out of the oven, while the chocolate was still gooey. I don't usually make these. Partly because they have shortening, partly because beyond the peanut butter and those worthwhile moments of self-indulgence, they really aren't that good for you. But I like a good excuse, and this one is unbeatable: I signed up to make 2 dozen cookies, once a month, for four months. At my boys' school, they have an annual auction to raise money. It helps benefit the school; the school encourages everyone to attend, and expects a donation from each family. It is flexible: you can volunteer to work at the auction, to help organize, or you can purchase an item to be bid on in a silent or live auction. This year, I decided to offer something that didn't require great expense, but was still worth a bid or two. So I offered to make two dozen homemade cookies, hand delivered, once a month from January-April (the auction was in December). It sold immediately. How cool is that? Each month, I wrap up 2 dozen cookies, usually 1 dozen of one kind, and a dozen of another kind. February cookies included these peanut butter, chocolate kissed cookies. And the side benefit of this monthly gift? It is a double gift (cliche for the gift that keeps on giving): I make extras, and my boys enjoy little treats in their lunches. It forces me to take out time to make homemade cookies---to offer lovingly baked treats in their lunches... kind of like a little midday, mom-delivered kiss. Mix shortening, peanut butter, sugars, and egg. Blend dry ingredients (Okay, Betty Crocker says chill for an hour; I am thinking: what, shot of tequila, feet up, read a book? Hey, when Betty says 'chill' I an all over it. Who would argue? The dough can wait... put it in the fridge while you take a break). Oven to 375. Roll dough into 1 inch balls, roll in sugar. Bake 10-12 minutes. When just out of oven, insert 1 hershey kiss into each cookie, pressing it into the cookie.